The 1970s Diet: Nessa is back..
......yes! With an update on her weight loss journey. You may recall that she is on a 'low carb' diet and give you all the necessary details and what not below. More importantly we have the before and after pics - she's still not finished yet but I'm sure you'll agree that you can see a massive difference. Not forgetting me and my weight loss journey - I lost another 2lbs this week. I got through the 2 week 'starving' barrier (hooray for me but lets face it non of us really know what its like to be truly 'starving'). I duly transferred two of my marbles into the milk bottle. I didn't complete any additional workouts last week asides from what I told you in my last blog post. I am setting the alarm tomorrow to fit in a weights workout and possibly some skipping. I am meeting a friend with the kids for a walk in the woods followed by lunch. She is also watching her intake (much slimmer than me) so healthy choices all round tomorrow. In matters of my eye - the steroid creams etc aren't making that much of a difference so may phone the opticians tomorrow to see if they can fit me in on Thursday. I have to say I have never known so many health issues since I reduced my calorie intake - dry skin patches on my hand and neck, more grey hairs and eyegate - lets hope its only temporary. Hi everyone, sorry my latest instalment has been rather late however, I don't have Tasha's blog posting mojo and actually putting fingers to keyboard is not something that comes easily! Tash emailed me the other week wanting to know exactly what I ate as she was rather keen to up her weight loss. As she can testify, its quite restrictive and certainly not for everyone. In fact, I find it much easier in the week as its easier to fall into a routine around the daily dregs of office life. So, for all those who are interested, here are some do's and dont's. First of all, this is not a no carb diet but a low carb one. All the carbs you need you get from your veg and salad so if you chose to there is plenty of variety. The main golden rules however is that you have to eat a lot of fat and drink lots of water (at least 3.5 ltrs). Now all of you who diet will probably be recoiling in horror as we have been programmed to think that fat is BAD!. Now I have done a bit of reading around the science which gave me some comfort and actually it seems to work. Breakfast - cheese or mushroom omelet cooked in butter. Lunch - cheese and ham salad with mayo. Dinner - belly pork or chicken thighs with cauliflower cheese or broccoli. You can eat as much as you like, however the reality is that I am eating less as the fat fills you up far quicker than carbs and you don't feel hungry for ages. In fact there are days when I don't really fancy dinner which would have been unheard of 4 months ago! Things you absolutely cant eat are bread, potatoes, pasta, sugar in any form, plus some veg are high carb ie carrots so I try to avoid these in large quantities. To date I have lost 30lbs. March has been rather a social month and I have been dining out or cooking for friends at least twice a week, yet the weight is still coming off, albeit more slowly. I am drinking wine on these occasions too so I don't actually feel like I'm on a diet, which I guess is rather key if I want to sustain this way of eating. 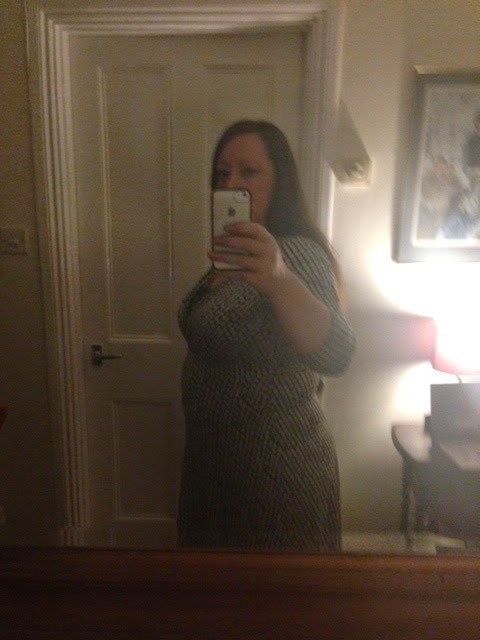 Here is a picture of me in the same dress I wore on the 31st December. I even bought a size 14 dress this week and it fitted really well!! I'm going to push a bit harder in April. The social calendar is far quieter so I am hoping to have lost another 7lbs by the 5th May. Then I head off to Badminton Horse Trials where my horse is competing so things may slip slightly on the booze front for that weekend! Thank you Ness - looking forward to May's update on the weight loss front! Sorry it took me so long to read this, we've been travelling. Amazing results - I'm inspired all over a gain. You must be feeling great Ness. Well done and I look forward to the next installment. Have a good Easter and good luck at Badminton!